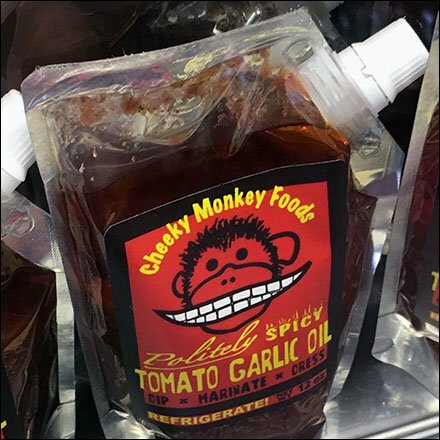 Pouch packaging is a growing approach to presentation, and here Cheeky Monkey Gusset Pouch Merchandising fronts the Deli Case offering a spicy upgrade to any and all purchases. Labeling and branding cry out for attention. The gusset pouch packaging is self-standing and self-displaying. A twist top spout allows for dispensing right from the packaging. This Cheeky Monkey Gusset Pouch Merchandising seen at Goldsteins Deli, Kingston, Pennsylvania.